Many thanks for your support and donations and also for your feedback and ideas. Today we’ll talk a little bit about some of the negative aspects of Free Software development, but before we do, I want to emphasize how lucky we are here at Linux Mint to have this community and this level of support. It’s not always easy to achieve what we want, sometimes it’s not even easy to define what we want to achieve. We can have doubts, we can work really hard on something for a while and then question it so much, we’re not even sure we’ll ship it. We can get demotivated, uncertain, depressed even by negative reactions or interactions, and it can lead to developers stepping away from the project, taking a break or even leaving for good. And then sometimes simply seeing people enjoy what we did can boost an entire team, whether it’s seeing happiness in an email/comment or getting a feeling of satisfaction after a constructive interaction which leads to a fix or an implementation. I personally haven’t enjoyed this development cycle so far. 2 of our most talented developers have been away. Boosting performance in the Muffin window manager hasn’t been, and still isn’t, straight forward. Feedback on the new website and logo brought a huge amount of incertitude. We’ll still have a great release in the end and we’ll still achieve plenty of improvements (we did already to a certain extent), but we need to be strong and remain confident and it’s not easy when so much time is invested into something and then a month later it’s not ready, or it causes other issues, or it might please some people but not others. For a team to work, developers need to feel like heroes. They want the same things as users, they are users, they were “only” users to start with. At some stage they decide to get involved and they start investing time, efforts and emotions into improving our project. What they’re looking for the most is support and happiness. They need feedback and information to understand bugs or feature requests and when they’re done implementing something, they need to feel like heroes, they literally do, that’s part of the reason they’re here really. I can show them 500 people donated money last month, I can forward emails to the team where people tell me how much they love Linux Mint, I can tell them they’re making a difference but there’s nothing like interacting directly with a happy user, seeing first-hand somebody be delighted with what you worked on. How our community interacts with our developers is key, to their work, to their happiness and to their motivation. This is something we read within the team and of course I think most Free Software developers can relate to. What I really enjoyed in Georges’ blog post is that he illustrated how from being a user, he became a contributor, and from there how he eventually became a developer. We sometimes feel a divide between “users” and “developers”, as if they were different people, as if users weren’t developers and developers weren’t users and that’s ridiculous. The notion that an empowered developer can’t understand something that is clear for everyone else is something we see in the streets, in politics. It’s a populist notion where empowerment is corrupt and the street knows best. That’s not how it works here, there’s no difference between a user and a developer other than their level of investment within the project. Anybody can and should contribute to the best of their ability to tackling the problems they have knowledge of. I think I have a tough skin and it is my role also to protect this project, the people I work with and the community around us. We can have so much fun working together, I think it’s important we nurture these relationships and ensure the interactions remain as positive and constructive as possible. Feedback is something we should love, not something we should fear. It’s what fuels our project and our development. When developers do things right, the changes they commit result in users being even more happy. When users do things right, the feedback they give results in developers being even more motivated. We’re very careful not to frustrate users with (sometimes necessary) code changes. It is important for our community to not demotivate those who within itself stepped forward to become the so-called developers. Before I move on to the next topic, I’d like to say thanks to Georges Stavracas for his work on GNOME Calendar. It’s a great application and we were delighted to add it to Linux Mint 19. The feedback on the new website design left us perplex. First of all, I’d like to thank all the people who gave us feedback on this. It wasn’t what I expected, but it does always help. I think we already knew that our community is split between people who embrace the new trends (flat style, no gradients, simple lines/shapes…etc) and people who don’t enjoy them. We have that in mind when developing software (we use new widgets here and there but not as liberally as in say GNOME) and themes (such as Mint-Y and Mint-X). We want to look modern but not avant-garde, and we want to keep support for what people loved in the past and continue to enjoy. I didn’t think so many people enjoyed our current website, and that really surprised me. It does make sense though, the trend nowadays on the Web is for websites to look flat, they all do, and failing that they look old, and that’s the problem we’re trying to tackle: Our website looks really outdated. Within the feedback, and putting the dislike for the new trends aside, I noted that the new design was a bit generic and didn’t convey enough identity. It’s a good point and it’s something we need to work on. I also gathered similar feedback on the icon. I’d like to thank Grady and SebastJava for their work within the design team. I’m not sure we’ll push the change during this cycle, it will depend on how other things go I think, but the more we’re looking at it the more we feel the need for versatility, even at the cost of looking unique. That leaf shape, and its border in particular, is restricting us in many ways and preventing us from producing crisp visuals in some areas of the operating system. The simpler the logo is the more shapes/buttons/backgrounds it can adapt to. We’ll document that as we go along. For now, just like the website, this is still pretty much a work in progress. A project was started to improve the artwork for Linux Mint 19.2. It’s available as a milestone and you can follow its progress on Github at https://github.com/linuxmint/mint-themes/milestone/1. Some of the work items in this project were implemented. Some reviews of Linux Mint 19 and 19.1 criticized the quality of the fonts and the overall contrast. These two aspects were looked at in detail. The fonts were switched to the Ubuntu fonts. They look slightly nicer and removing the Noto fonts (fonts-noto, fonts-noto-hinted and fonts-noto-unhinted) also allowed us to fix a bug which caused stuttering in Chromium. The work done on this is available at https://github.com/linuxmint/mint-themes/issues/200. The theme contrast in Mint-Y went under heavy scrutiny. We did improve it twice after all, and if we were still getting negative feedback, so it was time to really analyze this, write down anything that could be wrong with it, fix it and stand our ground once the job was done. This is available at https://github.com/linuxmint/mint-themes/issues/198. One of the key things in there were the missing improvements in GTK2, this is fixed now. Last but not least, we looked at fullcolor action icons. This is probably the biggest improvement in terms of contrast. The issue and its solution are described at https://github.com/linuxmint/mint-themes/issues/197. It’s all about Muffin at the moment. We’re trying to make it smoother, to make the windows feel lighter… radical changes and refactoring occurred, it’s eating a lot of time and we’re chasing regressions left, right and center. This is documented at https://github.com/linuxmint/cinnamon/issues/8454. It’s a really tough exercise, it creates tensions within the team but the potential is there, if we can make our WM snappier it’s worth the hassle. The ability to switch VSYNC on or off no longer requires restarting Cinnamon and we’re adding a combo in the preferences to be able to choose the VSYNC method. It’s a bit technical… there are 3 VSYNC techniques if I may say so, we were always using the same one. We’re now letting users switch to the other two so that we’re able to gather feedback and get a better idea of their pros and cons on various hardware and conditions. A printer applet, based on the printers@linux-man, will be added to the core project and loaded in Cinnamon by default. You may have noticed some of our servers went down lately. This has happened three times so far and it’s due to a power issue in one of the data centers we’re using. We were promised the issue would soon be resolved permanently. We’re keeping an eye on this and we would like to apologize for the inconvenience. It will be available in 32-bit and 64-bit and in three editions: Cinnamon, MATE and Xfce. Its base will continue to be Ubuntu 18.04, it will supported until April 2023 and upgrading to it will be safe and easy. We’re currently working on making it possible to “Alpha-test” Linux Mint. A “Daily Build” PPA is available at https://launchpad.net/~linuxmint-daily-build-team/+archive/ubuntu/daily-builds. This PPA gathers the latest code changes for the software we work on (Mint tools, Xapps, Cinnamon etc..), builds packages on a daily base and provides software updates. Be warned, daily builds are unstable by definition and translations aren’t complete until we get close to BETA. We’ll soon document how to use this PPA and how to report regressions to the team within the Developer Guide. We’re hoping to have more eyes and more feedback as we go along, within the development cycle, to identify regressions sooner than later and make the BETA phase a little less intense than it currently is. The Update Manager received a huge number of improvements (again). We’ll go through this in detail, with screenshots, in the next blog post. The Blueberry systray menu now lets you connect or disconnect paired devices with a click of the mouse. $218 (6th donation), Jan S.
$150, Fabio D. M. Q. G.
$136 (2nd donation), Michael J. $101 (4th donation), Carl J. $100 (2nd donation), William R.
$100 (2nd donation), W G. M.
$82 (2nd donation), W. S. .
$60 (3rd donation), Barbara B. $54 (4th donation), Naoise G.
$50 (17th donation), Robert D B. $50 (8th donation), Michael C.
$50 (4th donation), Greg C.
$50 (3rd donation), Terrence P.
$50 (3rd donation), Carlos H. G. C.
$50, Miguel F. D. C. M.
$44 (2nd donation), Michael D.
$44 (2nd donation), Anna U. $33 (107th donation), Olli K.
$33 (5th donation), Stephen M.
$30 (3rd donation), Anthony C.
$30 (3rd donation), Joe L.
$30 (2nd donation), Glen K.
$27 (2nd donation), Gerhard H.
$27 (2nd donation), Wilfried J. $25 (90th donation), Ronald W.
$25 (6th donation), Kirill C.
$25 (5th donation), Frederick M.
$25 (5th donation), Yun-Jhong W.
$25 (4th donation), David L.
$25 (4th donation), Scott O. $25 (3rd donation), Donald F.
$25 (2nd donation), Nikola N.
$22 (24th donation), Derek R.
$22 (11th donation), Per J. $22 (10th donation), David M.
$22 (7th donation), Henrik H.
$22 (6th donation), Florent G.
$22 (5th donation), Maurice G.
$22 (3rd donation), Arvi O. $22 (3rd donation), Evgenii S.
$22 (3rd donation), Oliver E.
$22 (2nd donation), Maciej T.
$22 (2nd donation), Andrew W.
$22 (2nd donation), Niklas E.
$22 (2nd donation), José G.
$20 (20th donation), Peter D.
$20 (15th donation), Lance M.
$20 (8th donation), John D.
$20 (8th donation), Donald M.
$20 (5th donation), Peter R.
$20 (5th donation), Timothy C.
$20 (5th donation), Lamont C.
$20 (5th donation), Mladen M.
$20 (5th donation), Douglas H.
$20 (3rd donation), Tony C.
$20 (3rd donation), Kai-ming L.
$20 (3rd donation), Gary A. $20 (3rd donation), Lupe A. $20 (2nd donation), Robert M. J. $20 (2nd donation), Raul A. $20 (2nd donation), Rejean L.
$20 (2nd donation), Edmund S.
$20 (2nd donation), Data H. I. $20 (2nd donation), Ramon A. $20 (2nd donation), George I. $20 (2nd donation), Lal C.
$17 (26th donation), Johann J. $16 (25th donation), Andreas S.
$16 (4th donation), Krister R.
$16 (3rd donation), Franklin P.
$16, Miguel A. C. L.
$15 (8th donation), Juergen G.
$15 (5th donation), Kiyokawa E.
$15 (3rd donation), Lindsey H.
$15 (2nd donation), John C.
$15 (2nd donation), Larry U. $11 (30th donation), Frank K.
$11 (27th donation), Paul O. $11 (6th donation), Alain P.
$11 (5th donation), Vittorio F.
$11 (3rd donation), Kostas K.
$11 (2nd donation), Alf J. $11 (2nd donation), Macario S. C. T.
$11 (2nd donation), Kimmo K.
$11 (2nd donation), Chrysanthos K.
$11 (2nd donation), Franck G.
$11, Kepa K. D. B. $10 (39th donation), Thomas C.
$10 (24th donation), Jim A. $10 (16th donation), Terrance G.
$10 (16th donation), Rick R.
$10 (11th donation), Elsukov V.
$10 (5th donation), Andrew C.
$10 (4th donation), Anatolii B. $10 (3rd donation), Modesto P. V.
$10 (3rd donation), Alfred H.
$10 (3rd donation), Adrian S.
$10 (3rd donation), Eitan R.
$10 (2nd donation), Phillip F.
$10 (2nd donation), Ian K.
$10 (2nd donation), Vincent D.
$10 (2nd donation), Eduardo B. $10 (2nd donation), Edward U. $10 (2nd donation), Harry S.
$9 (2nd donation), Christian F.
$5 (33rd donation), Eugene T.
$5 (14th donation), Olaf B. $5 (4th donation), Dirk S.
$5 (4th donation), Sergei K.
$5 (3rd donation), Matteo A. $5 (2nd donation), Raphael M. S.
$5 (2nd donation), Zbyszek S.
$5 (2nd donation), Chadwick C.
$5 (2nd donation), Daniel C.
$5 (2nd donation), Milan H.
$5 (2nd donation), Daniel J. $5 (2nd donation), Vadym M.
$5 (2nd donation), Cls D.
$2.77 (2nd donation), Trina Z.
Linux Mint is proudly supported by 233 patrons, for a sum of $1,251 per month. Hi everybody! Before we get started, I’d like to thank all the people who support us, many thanks to all of you for helping us the way you do. We’ve got quite a bit of news this month and we’re eager to get your feedback. We’re working on a new design for our main website. When the current design (and logo) were originally designed they carried a strong identity and we grew quite attached to them. For a while now we were hoping to get a new unique design which would look brand new but still carry that very same feel, and that was very hard to achieve. In the meantime, we stayed with something that was stuck in the past and that just doesn’t work well nowadays. We’ve heard many people ask why our website looks so old, and I think it’s time we do something about that. Rather than waiting forever for the perfect design, we decided to purchase modern looking designs which were based on Bootstrap and to use them to build something clean, that would work on all devices and that could be maintained and modified easily going forward. The layout above is used by content pages. 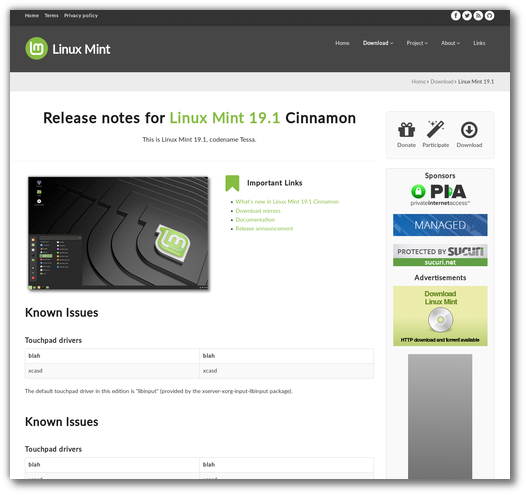 The main landing page has a different layout, with no sidebar, less text and more prominent elements to introduce what Linux Mint is and present its main features. We’re currently focusing our efforts on the header bar and the sponsors section. The header bar should receive a background or a texture which will make it more minty and give the website more identity. Its navigation menu will also be centered and placed below the title to allow for a larger logo. In the sponsors section we’re hoping to use monochrome logos which will fit better with the design. It doesn’t scale down well. When small (for instance for a favicon, or an application menu logo), its design is too complex to be rendered properly in a limited number of pixels. It looks off-center because of its non-symmetrical border, with empty space on the left and none on the right. We’ve been working around these issues for a while now. In previous releases we shipped with flat, semi-flat and symbolic versions of the current logo (your application menu logo in 19.1 is an example of this) but we can’t address all the issues without removing that border in the shape of a leaf. One the one hand, it’s hard because we’re attached to it, it’s a strong visual symbol and it’s been part of our identity. On the other hand it opens the door to crisper visuals, better looking panels, menus and splash screens so we’re looking into it. Some of the performance improvements we talked about last month landed in Cinnamon. The window manager received many changes to further decrease input lag and the application menu applet now loads and runs twice as fast as before. DocInfo and AppSys, two very important internal components were reviewed and simplified. The cinnamon-menus library was ported to Meson and is currently being reviewed and simplified by Stephen Collins. gm10 is leading the charge in improving the Mint tools. The cache used by the Software Manager was moved to mint-common, turned into a Python module and given the ability to recognize manually installed software. This is achieved by analyzing the installer logs coming from Ubiquity. 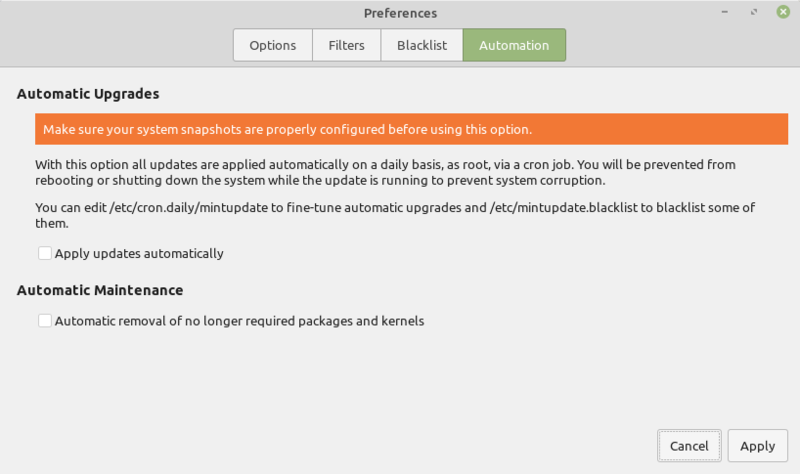 As a consequence, in Linux Mint, the Backup Tool and the Software Manager will be able to share the same cache and to list not only the applications which were installed via the Software Manager, but also the applications which were installed via other means. We spent some time working on mintreport, the “System Reports” tool. The user interface now features an XApp sidebar and a new page was added to show the system information and make it easy for users to copy it into the forums or upload it to a pastebin website. We’re also happy to announce mintreport is coming to LMDE 3. 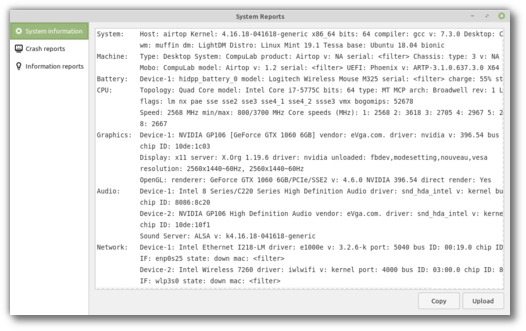 In the past, mintreport relied on Ubuntu’s “apport” to collect and generate crash reports. It now uses systemd-coredump which adds more information to the stack traces and is available in other distributions. $500 (3rd donation), James C.
$109 (2nd donation), Marcus H.
$100 (11th donation), Philip W.
$100 (7th donation), Trevor H.
$99, Ahmad A. A. M. S. A. B. $75 (5th donation), John M.
$54 (6th donation), Derek L.
$54 (3rd donation), Mikko I. $54 (2nd donation), Ivo K.
$54 (2nd donation), Bruce J. $54 (2nd donation), Niels K. S.
$54 (2nd donation), Erno I. $54 (2nd donation), Jose L. D.
$54, Pieter B. D. J. $50 (2nd donation), Martin C.
$50 (2nd donation), Evan M.
$50 (2nd donation), Andras P.
$50 (2nd donation), L. H. .
$49 (2nd donation), Viktor V.
$44 (2nd donation), Christian M.
$44, Michele T. D. F.
$38 (2nd donation), Svend M.
$35 (2nd donation), Timothy J. I. $33 (106th donation), Olli K.
$33 (3rd donation), Jürgen H.
$33 (2nd donation), R. Sch. $33 (2nd donation), Francesc M. C.
$33 (2nd donation), Renaud C.
$30 (2nd donation), Amit L.
$30 (2nd donation), Riccardo C.
$30 (2nd donation), P. P. .
$30 (2nd donation), Frank R.
$27 (8th donation), Ralf D.
$27 (3rd donation), Laszlo R.
$25 (89th donation), Ronald W.
$25 (29th donation), Larry J. $25 (8th donation), Charles W.
$25 (7th donation), Steve T.
$25 (4th donation), Vincent M.
$25 (4th donation), Ranald C.
$25 (2nd donation), Michael S.
$25 (2nd donation), Alex S.
$25 (2nd donation), Karl B. $25 (2nd donation), Philip J. $25 (2nd donation), Jean-pierre G.
$25 (2nd donation), Jignesh R.
$25 (2nd donation), Derek B. $25 (2nd donation), Allen C. W.
$22 (23rd donation), Derek R.
$22 (9th donation), David M.
$22 (8th donation), Janne S.
$22 (5th donation), Gabriel T.
$22 (4th donation), Peter V.
$22 (3rd donation), Christoph B. $22 (2nd donation), Jens B. $22 (2nd donation), Jure V.
$22 (2nd donation), Wolfgang H.
$22 (2nd donation), Modesto P. V.
$22, Claudio M. M. V.
$21 (2nd donation), Gerardo R.
$20 (28th donation), Larry J. $20 (14th donation), Lance M.
$20 (6th donation), Bryan F.
$20 (3rd donation), Guy L.
$20 (3rd donation), Pj S.
$20 (3rd donation), Sebastian W.
$20 (3rd donation), Rick D.
$20 (2nd donation), Dana S.
$20 (2nd donation), Roy L.
$20 (2nd donation), Jairo C.
$20 (2nd donation), Colin S.
$20 (2nd donation), Mark B. $20, Juan G. R. D. L.
$16 (25th donation), Johann J. $16 (24th donation), Andreas S.
$16 (15th donation), Doriano G. M.
$16 (12th donation), Gerard C.
$16 (4th donation), Alessandro L.
$16 (3rd donation), Krister R.
$16 (2nd donation), Laurent M.
$15 (19th donation), Stefan M. H.
$15 (11th donation), Michel C.
$15 (2nd donation), Fred B. $13 (3rd donation), Artur M.
$13 (2nd donation), Thorsten K.
$12 (2nd donation), Brent F.
$11 (19th donation), Alessandro S.
$11 (5th donation), Jerome M.
$11 (5th donation), Barry J. $11 (4th donation), Vittorio F.
$11 (4th donation), Bernhard M.
$11 (3rd donation), Bertrand S. J. $11 (3rd donation), Philip E.
$11 (2nd donation), Paolo C.
$11 (2nd donation), Evgenii S.
$11 (2nd donation), Joseba S. I. $11 (2nd donation), Benoit V.
$11 (2nd donation), René C.
$11 (2nd donation), Cedric B. $11 (2nd donation), Elias B. $11, Gerwin P. V. D.
$10 (38th donation), Thomas C.
$10 (29th donation), Frank K.
$10 (26th donation), Paul O. $10 (23rd donation), Jim A. $10 (16th donation), Dmitry P.
$10 (15th donation), Rick R.
$10 (15th donation), Terrance G.
$10 (12th donation), Chris K.
$10 (11th donation), Antoine T.
$10 (5th donation), Neil E.
$10 (4th donation), Don S.
$10 (4th donation), Mladen M.
$10 (4th donation), Tyler B. $10 (3rd donation), Mark W.
$10 (3rd donation), Anatolii B. $10 (2nd donation), Graham G.
$10 (2nd donation), Roswitha O. $10 (2nd donation), Graham J. $10 (2nd donation), Rodrigo S. B. $10 (2nd donation), Jack S.
$10 (2nd donation), Anton D.
$10, Daniel C. D. S.
$8 (2nd donation), Nicholas H.
$7 (3rd donation), Nicholas P.
$6 (7th donation), Michal W.
$5 (32nd donation), Eugene T.
$5 (7th donation), Michel B. $5 (6th donation), Pierre G.
$5 (4th donation), Clint M.
$5 (4th donation), Jozo M.
$5 (4th donation), Pawel K.
$5 (3rd donation), Franco C. M.
$5 (3rd donation), Christoph C.
$5 (3rd donation), Fabio N.
$5 (2nd donation), Greg R.
$5 (2nd donation), Ruslan A. $5 (2nd donation), Christian W.
$5 (2nd donation), Joseph G.
$5, Ed V. D. M.
$5, Carl-magnus R. V. C.
$4 (3rd donation), Tomasz W.
$3.5 (2nd donation), Frederick F. J. $3 (5th donation), Cyril U. $3 (4th donation), David H.
$3, Island Web Solutions, Inc.
Linux Mint is proudly supported by 217 patrons, for a sum of $1,146 per month. It’s always a treat for us to unveil what we’ve been working on and to have it ready on release day. That’s when we get feedback and we see people enjoy it. Witnessing a happy user who is delighted with the changes we implemented is very special, and so is the general feeling that a release went well and that its reception was very positive. We get that thanks to a vocal community here on the blog, on the forums and on IRC. When a month later stats show close to 700 people were so happy with us they sent us money, it gives us a sense of scale and we know there’s also a silent audience who enjoyed what we did. It’s humbling, it’s motivating, it’s really a great feeling. Thank you very much for this, not just for the money, but for that awesome feeling you’re giving us. The 19.1 release and the port to LMDE 3 went well so we were able to start the development cycle early this month. Normally we catch up with pull requests (we currently have 92 open) and we start implementing what’s on the roadmap, but as we’ve got time in front of us and in reaction to some of the feedback we gathered, we spent most of January on R&D, design considerations and ambitious tasks. Three areas in particular were given attention: Artwork, performance and the idea of splitting Cinnamon into different processes. I usually prefer to talk about what we achieved rather than what we envision and this certainly isn’t a promise. We’re deep into this at the moment, it will lead to improvements but some of these ideas and projects will also probably fail or not lead to anything in the short/middle term. In terms of artwork, we’re considering adding more contrast (again), changing the default font, and giving our boot and splash screens (isolinux, grub and plymouth) a new look. We’re also looking at the possibility for the boot screens of the live ISO to support language and keymap selections. 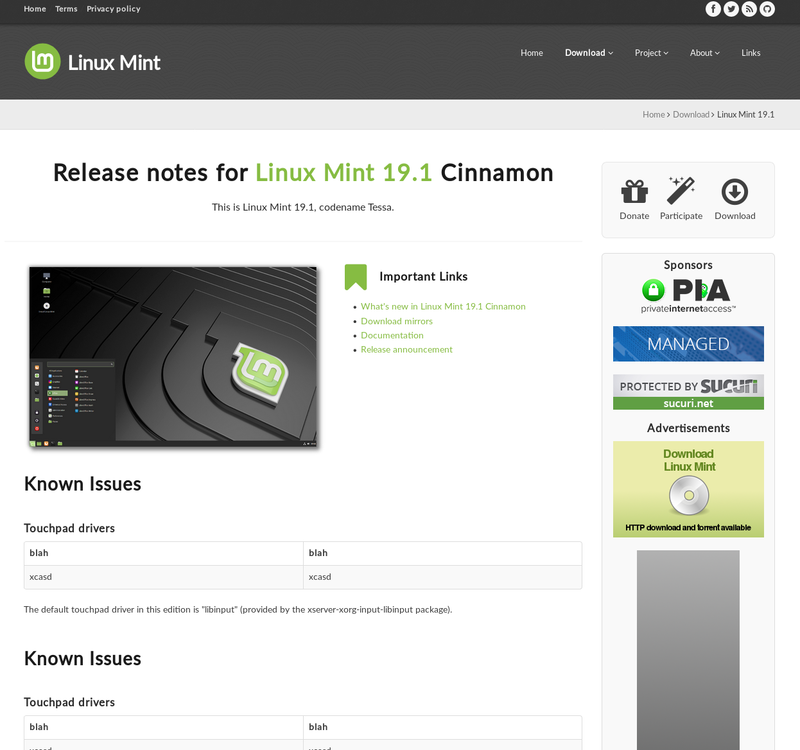 Another area we’re working on is the Linux Mint website. We purchased some beautiful designs and we’re selecting them and adapting them to turn www.linuxmint.com (and eventually also community.linuxmint.com) into websites which look more modern and which look good no matter what device you browse them with. In Cinnamon we’re reviewing two internal components: DocInfo, which is responsible for the management of recent documents, and Appsys (in conjunction with cinnamon-menus) which is responsible for application metadata (how to launch a particular app, how to build the application menu, which windows are related to which app, what icons/actions does an app have..etc..). There is a lot of technical debt in these two components and they account for most of the loading time. We’re also looking at the application menu at lot, simplifying its use of DocInfo and Appsys of course, but also trying to reduce its impact on framerate (itzexor in particular is looking at the Clutter and St objects we’re using and optimizations in PopupMenu classes) and being smarter with lazy-loading. Some of the discussions lead to the idea of replacing the “All applications” category with a category which would list recently used and newly installed applications, other than the functional interest in such a feature, it would allow us to boost the menu performance. Michael Webster is working on something really complicated, something we’ve talked about since the dawn of time… splitting Cinnamon into multiple processes. He’s studying the possibility of having applets run in their own process and render objects remotely. This is very ambitious and pretty much R&D at this point. We’re hoping he’ll succeed with a prototype. Failing that there’s also the idea of keeping the rendering of the applet content in Cinnamon itself and only delegating the processing (similar to dbus–menu), or to keep Cinnamon and applets together and split away the WM. 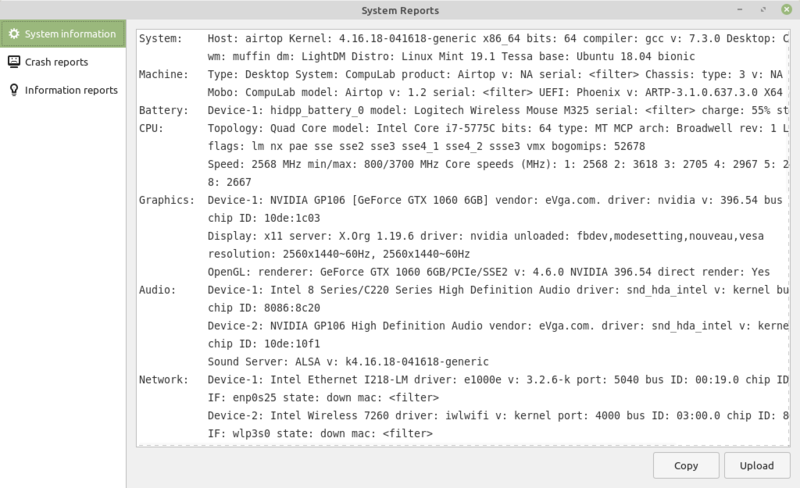 Jason Hicks continues his work on improving the grouped window list, the window manager and optimization of input lag. It’s a bit complicated within the team now because we’re all focused on slightly different areas but they often impact each others. We’re not going as fast as we’d want, it’s hard to reach consensus at times, the design concepts at play are complex and some of the metrics are very hard to measure, but we’re talking about this a lot and making progress slowly but surely. We spent time on our own development tools also, in particular on something called cinnamon-stat-stracker which is able to measure loading times, and idle resource usage (CPU, RAM, FDs..etc) over time. We welcomed gm10 within the team. 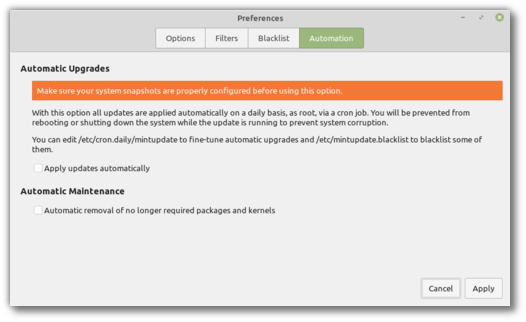 He’s contributing a lot to some of the mint tools, in particular to the Update Manager and the Software Sources. $4500 (3rd donation), Neil V.
$182 (3rd donation), Tanev, T.
$150 (3rd donation), John M.
$115 (5th donation), Stefan S.
$109 (5th donation), Martin R.
$109 (3rd donation), Jürgen A. $109 (2nd donation), Oliver Z. $109 (2nd donation), Eric P. K.
$109 (2nd donation), Thorsten L.
$100 (7th donation), Efran G.
$100 (5th donation), Mirza B. $100 (5th donation), Sean O. $100 (4th donation), Kory W.
$100 (2nd donation), Joseph R.
$100 (2nd donation), Steve M.
$100 (2nd donation), Ross D.
$75 (4th donation), Rich H.
$75 (4th donation), Walter W.
$70 (4th donation), Marie I. $60 (2nd donation), James L.
$55 (2nd donation), Michael D.
$54 (5th donation), Frank M.
$54 (4th donation), Christian D.
$54 (2nd donation), Torsten P.
$54 (2nd donation), Jean-françois H.
$54 (2nd donation), J. J. $54 (2nd donation), Alain V. L.
$54 (2nd donation), Arnd S.
$54 (2nd donation), Joachim J. $50 (27th donation), Larry J. $50 (9th donation), Hans J. $50 (8th donation), Stephen A. $50 (8th donation), Adam H.
$50 (7th donation), Douglas J. $50 (7th donation), Robert H. B. $50 (6th donation), Bill R.
$50 (6th donation), Cody W. H.
$50 (5th donation), Wade T.
$50 (5th donation), Basic I. I. $50 (4th donation), Steven C.
$50 (4th donation), Harry H. I. $50 (4th donation), David S.
$50 (3rd donation), David W.
$50 (3rd donation), Paul R.
$50 (3rd donation), William G.
$50 (3rd donation), Daniel B. $50 (2nd donation), Stacey F.
$50 (2nd donation), Michael L.
$50 (2nd donation), Mike M.
$50 (2nd donation), Omar T.
$50 (2nd donation), Ralph P.
$50 (2nd donation), Jerry A. $45 (6th donation), Pavel B. $44 (3rd donation), Ben E.
$44 (3rd donation), Brian M.
$44 (2nd donation), Manfred S.
$40 (24th donation), Wolfgang P.
$40 (2nd donation), Luca D.
$40 (2nd donation), Robert T.
$40 (2nd donation), Peter B. $34 (5th donation), Rosalea R.
$33 (8th donation), Luca D.
$33 (4th donation), Jean-claude M.
$33 (4th donation), Stephen M.
$33 (3rd donation), Frank J. $33 (3rd donation), Jürgen F.
$33 (2nd donation), Reijo H.
$33 (2nd donation), Urs N.
$32 (2nd donation), Clifford H.
$30 (4th donation), Stuart B. $30 (4th donation), Devendra R.
$30 (3rd donation), Marcus H.
$27 (23rd donation), Andreas S.
$27 (7th donation), Martin I. $27 (6th donation), Michael S.
$27 (5th donation), Frank V.
$27 (4th donation), Andreas M.
$27 (3rd donation), Marco V. D. B. $27 (2nd donation), Michael M.
$27 (2nd donation), Martin S.
$27 (2nd donation), Mike C.
$27 (2nd donation), Hendricus P. D. V.
$27, Marinus V. D. W.
$25 (26th donation), Larry J. $25 (12th donation), Kevin S.
$25 (8th donation), Jack C.
$25 (6th donation), Vaughan B. $25 (6th donation), Frances K.
$25 (4th donation), Gary E.
$25 (4th donation), Brian H. Y. $25 (4th donation), Andrew C.
$25 (4th donation), Daniel B. M.
$25 (3rd donation), Edmond I. $25 (3rd donation), Frederic R.
$25 (3rd donation), Brian S. G.
$25 (3rd donation), Yuriy G.
$25 (3rd donation), William E.
$25 (2nd donation), Wiilliam N. H.
$25 (2nd donation), Bruce G.
$25 (2nd donation), George A. $25 (2nd donation), Lukas S.
$25 (2nd donation), Robert S.
$23 (24th donation), Johann J. $22 (22nd donation), Derek R.
$22 (18th donation), Alessandro S.
$22 (9th donation), Pentti T.
$22 (8th donation), Rüdiger K.
$22 (8th donation), David M.
$22 (6th donation), Mark A. $22 (6th donation), Samuel H.
$22 (4th donation), Ralf O. $22 (4th donation), Stephen G.
$22 (4th donation), Alonso C.
$22 (3rd donation), Jesse C.
$22 (3rd donation), Christian K.
$22 (3rd donation), Ralph K.
$22 (3rd donation), Torsten B. $22 (3rd donation), Ralf R.
$22 (3rd donation), Benjamin L.
$22 (3rd donation), August F.
$22 (2nd donation), Jitao D. Z. $22 (2nd donation), Herberth M.
$22 (2nd donation), Sebastiano C.
$22 (2nd donation), Olaf K.
$22 (2nd donation), Martin H.
$22 (2nd donation), Illia D.
$22 (2nd donation), Eric W.
$22, José A. A. C.
$20 (18th donation), Mike C.
$20 (13th donation), Lance M.
$20 (7th donation), John D.
$20 (7th donation), Nigel B. $20 (6th donation), Brandon W.
$20 (6th donation), Luis G.
$20 (5th donation), Anthony L.
$20 (5th donation), Bryan F.
$20 (4th donation), Andrzej C.
$20 (4th donation), Leopoldo G.
$20 (4th donation), Andrew C.
$20 (3rd donation), Harjit T.
$20 (3rd donation), Akos T.
$20 (3rd donation), Joseph M.
$20 (3rd donation), Jean-Michel R.
$20 (3rd donation), Bruce F.
$20 (3rd donation), Mladen M.
$20 (3rd donation), Jose M.
$20 (3rd donation), Damian C.
$20 (2nd donation), David W.
$20 (2nd donation), Michael B. $20 (2nd donation), Kevin M.
$20 (2nd donation), Jeremy K.
$20 (2nd donation), Greg Z. $20 (2nd donation), Dave M.
$20 (2nd donation), M D. H.
$19.1 (13th donation), Ke C.
$19.1 (10th donation), François P.
$19.1 (7th donation), Malte J. $16 (16th donation), Francisco L. D. A. $16 (6th donation), Nigel B. $16 (5th donation), Dirk M.
$16 (2nd donation), Richard W.
$16 (2nd donation), Amy K.
$15 (7th donation), Andy N.
$15 (5th donation), Constantin M.
$15 (4th donation), Valentin B. $15 (4th donation), Doug F.
$15 (3rd donation), William B. Z. $15 (2nd donation), Neil B. $15 (2nd donation), Barry L.
$15 (2nd donation), Brian H.
$15, Diego R. D. M.
$13 (3rd donation), Theofanis-Emmanouil T.
$12 (3rd donation), Geoff M.
$11 (10th donation), Per J. $11 (8th donation), Isidro P. A. $11 (7th donation), Annette T.
$11 (6th donation), Ishiyama T.
$11 (6th donation), Michiel B. $11 (6th donation), Alan B. $11 (5th donation), Michele C.
$11 (5th donation), Soutarson P.
$11 (4th donation), Soeren S.
$11 (4th donation), M. B. .
$11 (3rd donation), Alexander P.
$11 (3rd donation), Thomas T.
$11 (3rd donation), Jan S.
$11 (3rd donation), Derek B. $11 (3rd donation), Tomislav K.
$11 (2nd donation), Andreas G.
$11 (2nd donation), Gerard V. S.
$11 (2nd donation), Vittorio F.
$11 (2nd donation), Karl K.
$11 (2nd donation), Patrick H.
$11 (2nd donation), Krylov A. $11 (2nd donation), Eyvind C.
$11 (2nd donation), Bernard W.
$11 (2nd donation), Peter G.
$11 (2nd donation), Hayden P.
$11 (2nd donation), Florian J. $11 (2nd donation), John T. C.
$11, A E. K. Y. $10 (37th donation), Thomas C.
$10 (28th donation), Frank K.
$10 (28th donation), Carlos W.
$10 (25th donation), Paul O. $10 (12th donation), Wilson G.
$10 (7th donation), John T.
$10 (6th donation), Martín P. D. L. G.
$10 (5th donation), Jeff F.
$10 (4th donation), Michael B. $10 (4th donation), Carlos V. M.
$10 (4th donation), Suraj S.
$10 (4th donation), An L.
$10 (4th donation), Clifton S.
$10 (4th donation), Franz W.
$10 (4th donation), Mohamed A. $10 (3rd donation), Christopher B. $10 (3rd donation), Ken R. S.
$10 (3rd donation), Troy T.
$10 (3rd donation), Joao K.
$10 (3rd donation), Timothy L.
$10 (3rd donation), James M.
$10 (2nd donation), Ivan V.
$10 (2nd donation), Anatolii B. $10 (2nd donation), Brian S.
$10 (2nd donation), Armin G.
$10 (2nd donation), Robert G.
$9 (13th donation), Tomasz K.
$8 (4th donation), Cyril U. $8 (2nd donation), Eric H.
$7 (4th donation), Gabriele I. $7 (3rd donation), Jan R.
$7 (2nd donation), Dražen D.
$6 (2nd donation), Tomasz W.
$5 (31st donation), Eugene T.
$5 (13th donation), Olaf B. $5 (10th donation), Elsukov V.
$5 (5th donation), Ian E.
$5 (4th donation), Stefan N.
$5 (4th donation), Johanna R.
$5 (3rd donation), Adam G.
$5 (3rd donation), Michele M.
$5 (3rd donation), Jouni S.
$5 (3rd donation), Mikhail S.
$5 (3rd donation), Sergei K.
$5 (3rd donation), Andrew I. $5 (2nd donation), Corrado N.
$5 (2nd donation), Saito T.
$5 (2nd donation), Minnigaliev R.
$5 (2nd donation), Kurt W.
$5 (2nd donation), John C.
$5 (2nd donation), Florian P.
$5 (2nd donation), Cristiano G.
$5 (2nd donation), Norton L. C.
$5 (2nd donation), Kevin D.
$5 (2nd donation), Albor J. A.
Linux Mint is proudly supported by 194 patrons, for a sum of $984 per month.